SAVANNAH, Ga., May 9, 2005 - Gulfstream Aerospace, a wholly owned subsidiary of General Dynamics (NYSE: GD), delivered the first Gulfstream G450 business-jet aircraft to its U.S.-based owner on May 7. "Just over two years ago the G450 took its first flight and today we’ve delivered the first of the series to its owner. We’ve met the development schedule that we committed to early on and have accomplished each program milestone on time, including today’s entry-into-service," said Pres Henne, senior vice president, programs, engineering and test, Gulfstream. "This aircraft features new electrical and environmental control systems, upgraded engines and nacelles, aerodynamic enhancements to the exterior, new thrust reversers, the PlaneView™ cockpit and the one-of-a-kind Gulfstream Enhanced Vision System™," continued Henne. "As a result, it flies further, faster and more efficiently. The aircraft also offers more space in the cockpit and baggage compartment and more usable space in the cabin." While the G450 builds on the success and proven dispatch reliability of the GIV/GIV-SP – the best-selling long-range business jet ever produced – it shares more similarities to its sister ship, the large-cabin, ultra-long-range G550. Both aircraft feature the exclusive PlaneView cockpit, which includes four large flight displays and Honeywell’s Primus Epic avionics and Visual Guidance System (VGS). The G450 and G550 also feature as standard equipment the award-winning Gulfstream Enhanced Vision System (EVS), which was developed to improve safety of flight by enhancing pilot situational awareness while reducing pilot workload. The Gulfstream EVS is the first system of its type certified by the Federal Aviation Administration (FAA). Powered by two Rolls-Royce Tay 611-8C engines, the G450 can fly eight passengers nonstop from Madrid to Caracas or Dallas to Paris, even on a very hot day. 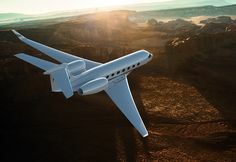 The G450 can cruise at altitudes up to 45,000 feet, well above commercial airline traffic, and at speeds up to Mach .88. The G450 cabin, which comes fully appointed, provides seating for up to 19 passengers. G450 passengers, especially those on long intercontinental flights, will appreciate the relaxing cabin atmosphere with three temperature zones, ample light streaming through 12 heated signature oval windows, 100 percent fresh air and a cabin altitude of 6,000 feet. G450 customers also can choose among a variety of cabin layouts, each designed to meet different types of travel needs. The G450, G550, G500 and G350 business jets all share numerous aircraft systems as well as the same pilot type rating. Customers who own fleets with two or more different Gulfstream aircraft will appreciate cost-savings that can be generated in terms of pilot, crew and maintenance training as well as reduced parts inventories. The Gulfstream G450 business jet took its first flight in April 2003, nearly six months before it was first introduced to the public on Oct. 6, 2003 at the National Business Aviation Association’s annual meeting. Less than a year later on Aug. 12, 2004, the FAA issued the Type Certificate for the G450. On Nov. 19, the European Aviation Safety Agency validated the FAA certification. Gulfstream Aerospace Corporation, a wholly owned subsidiary of General Dynamics (NYSE: GD), designs, develops, manufactures, markets, services and supports the world’s most technologically advanced business jet aircraft. Gulfstream has produced more than 1,500 aircraft for customers around the world since 1958. To meet the diverse transportation needs of the future, Gulfstream offers a comprehensive fleet of aircraft, comprising the mid-cabin, high-speed Gulfstream G100™; the wide-cabin, high-speed Gulfstream G150™; the large-cabin, mid-range Gulfstream G200™; the large-cabin, mid-range Gulfstream G350™; the large-cabin, long-range G450™; the large-cabin, ultra-long-range Gulfstream G500™ and the large-cabin, ultra-long-range Gulfstream G550™. Gulfstream also offers aircraft ownership services via Gulfstream Financial Services Division and Gulfstream Pre-Owned Aircraft Sales®. The company employs more than 6,750 people at seven major locations. We invite you to visit our Web site for more information and photos of Gulfstream aircraft at www.gulfstream.com.